The Innocents Society is the Chancellor’s senior honorary at the University of Nebraska-Lincoln. Founded on April 24, 1903, and uniquely Nebraskan, the Society has been leading the campus in all aspects and promoting school spirit for more than 100 years. In the spring, 13 new members are chosen from the junior class to carry on the Innocents Society’s traditions and goals. Part of this mission is the continuation of the society itself. Membership is based upon superior academic achievement, unparalleled leadership, and selfless service to the university and community. We wear dark sunglasses and robes not to frighten or intimidate, but to promote the group as a whole rather than our individual identities. We work for the betterment of the university and do not seek recognition or accolades for ourselves. 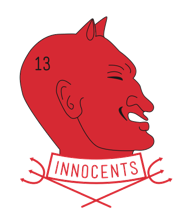 The Innocents Society was named for the 13 Popes Innocent. Historically, the Innocent Popes of Rome stood as champions against evil. It is our purpose to fight in the same manner, promoting all that is fair and honorable among students and with the University. Thus, the badge of the Innocents became the Mephistopheles’ head above crossed tridents, symbolizing the negative influences to be overcome by the society’s actions. The number 13 on the badge represents the 13 members of the Innocents who are working to preserve all that is good on campus. Be a Husker. Be an Innocent.